Let me start off by saying that the D800 is not a dream camera for street photography. It’s bulky, indiscreet, and the shutter is pretty loud. I usually would be using my GF1 while walking to the office, but I happened to be carrying the D800 and 85mm 1.8g to get a little time with both. I had just taken the shot in the previous post of the wine bottle corks. 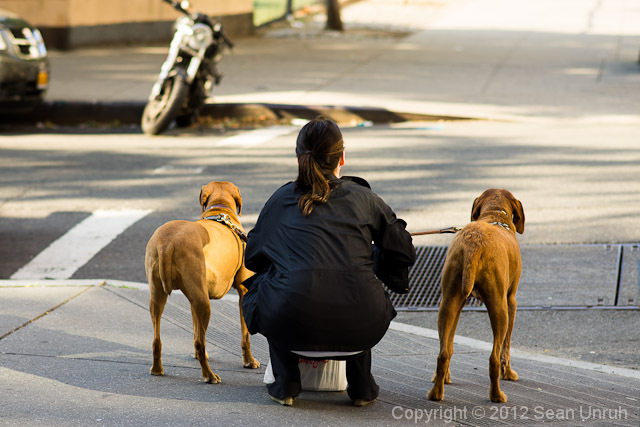 As I turned to move on, I caught this lady and her two dogs. I quickly took the shot, and started walking. As I walked over the same curb where she was crouching, I twisted my ankle, and fell into a push-up position in the street. A cabbie waiting the light was having a good laugh at me… luckily the camera was already in my bag and was not harmed. I call “Karma” on the situation… I had my laugh at the scene in the photo, and the cab driver had one at my expense.